Make a donation Changeons de menu ! In the best case scenario, Cameroonian farmers can rely on local government services and those from private organisations for information to help them better develop their activities and improve the lives of their families. 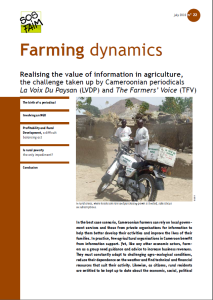 In practice, few agricultural organisations in Cameroon benefit from information support. Yet, like any other economic actors, farmers as a group need guidance and advice to increase business revenues. They must constantly adapt to challenging agro-ecological conditions, reduce their dependence on the weather and find technical and financial resources that suit their activity. Likewise, as citizens, rural residents are entitled to be kept up to date about the economic, social, political or cultural context in which they operate. But the mainstream media targets a mainly urban market and struggles to cover rural concerns. Fostering the intellectual development of people by other means makes sense. The rural world is interested not only in agricultural technique topics, but also in more complex topics such as biotechnology, climate change and agricultural policies. All these issues have to be covered by qualified persons who are able to convey meaningful messages to a public with limited formal education. This is the challenge which the LVDP and TFV periodicals strive to meet. N°37 | How rice import affect two West African countries? N°24 | How can family farms feed senegal? All Pictures © SOS Faim unless otherwise mentioned.